Abstract. The 1993 midwest flood was one of the most significant and damaging natural disasters ever to hit the United States. Damages totaled $15 billion, 50 people died, hundreds of levees failed, and thousands of people were evacuated, some for months. The flood was unusual in the magnitude of the crests, the number of record crests, the large area impacted, and the length of the time the flood was an issue. The paper discusses some details of the flood, the forecasting procedures utilized by the National Weather Service and the precipitation events which caused the flood. From May through September of 1993, major and/or record flooding occurred across North Dakota, South Dakota, Nebraska, Kansas, Minnesota, Iowa, Missouri, Wisconsin, and Illinois. Fifty flood deaths occurred, and damages approached $15 billion. Hundreds of levees failed along the Mississippi and Missouri Rivers. The magnitude and severity of this flood event was simply over-whelming, and it ranks as one of the greatest natural disasters ever to hit the United States. Approximately 600 river forecast points in the Midwestern United States were above flood stage at the same time. Nearly 150 major rivers and tributaries were affected. It was certainly the largest and most significant flood event ever to occur in the United States (Fig. 1). Tens of thousands of people were evacuated, some never to return to their homes. At least 10,000 homes were totally destroyed, hundreds of towns were impacted with at least 75 towns totally and completely under flood waters. At least 15 million acres of farmland were inundated, some of which may not be useable for years to come. Transportation was severely impacted. Barge traffic on the Missouri and Mississippi Rivers was stopped for nearly 2 months. Bridges were out or not accessible on the Mississippi River from Davenport, Iowa, downstream to St. Louis, Missouri. On the Missouri River, bridges were out from Kansas City, downstream to St. Charles, Missouri. Numerous interstate highways and other roads were closed. Ten commercial airports were flooded. All railroad traffic in the Midwest was halted. Numerous sewage treatment and water treatment plants were destroyed (Larson, 1993). The soil moisture model in primary use was the Antecedent Precipitation Index (API) model. API models have been used in most National Weather Service (NWS) River Forecast Centers (RFC) to produce flood crest forecasts since the 1940s (Fig.2). Hydrologists at NWS RFCs developed API procedures based on historical storm events. A given API value at the beginning of a rain event is typically related to the week of the year, the storm duration, and the amount of actual rainfall from the event. The API model used during The Great Flood of 1993 computes a daily index of soil moisture, considers additional rainfall, and computes any possible runoff. Various components are involved in the preparation of flood forecasts. Precipitation and temperature data are input into a snow model. This model determines whether the precipitation is rain or snow based on temperature input. The output from the snow model plus rain becomes input for the soil moisture model. Because of its empirical nature and physical limitations, the API model has a relatively short memory. The assumption is that during periods of no precipitation, soil moisture decreases logarithmically. Another limitation is that baseflow is not addressed directly. However, the model's ease of operation lends itself to quick operational adjustments. This feature allows hydrologists to make timely decisions in balancing the observed physical response with model computed results. Runoff from the soil moisture model becomes input for the flow model. The "unit hydrograph" technique is employed here. The unit hydrograph is an empirical normalization that represents 1 inch of runoff from rain falling uniformly over a specific basin for a given time step. Constant physical characteristics across the basin and similar hydrograph shapes from storms with uniform rainfall patterns are assumed. A unit hydrograph, to be used in conjunction with an event API model, is best derived from a single rainfall event when all surface runoff occurs in a given time period, e.g., 6 hours. Operationally, the runoff time step is 6 hours. This time step lends itself to data availability, i.e., 6-hourly synoptic precipitation reports. A storm hydrograph is determined by combining 6-hour incremental runoff values. While model computations are based on flow volumes, most river observations are only available as river stages. In addition, river stages are far easier for the public to comprehend. Therefore, a conversion between discharge and stage is necessary. This relation varies for each location and is affected by many factors. The rating curve is a relation between stage and discharge at a particular location and must be routinely updated. The above procedure produces a hydrograph for a headwater basin. In a continuous simulation model, all upstream flows at a given point, whether they are floodwaves or not, must be continuously routed to a downstream point. It is essential that this routed or predicted flow be accurate for the forecasting of flows at locations downriver. RFC's use a variety of routing techniques including dynamic routing, Tatum and Muskingum methods (Braatz, 1991). During June through August 1993, rainfall totals surpassed 12 inches across the eastern Dakotas, southern Minnesota, eastern Nebraska, Wisconsin, Kansas, Iowa, Missouri, Illinois, and Indiana. More than 24 inches of rain fell on central and northeastern Kansas, northern and central Missouri, most of Iowa, southern Minnesota, and southeastern Nebraska, with up to 38.4 inches in east-central Iowa. These amounts were approximately 200-350 percent of normal from the northern plains southeastward into the central United States. From April 1 through August 31, precipitation amounts approached 48 inches in east-central Iowa, easily surpassing the area's normal annual precipitation of 30-36 inches. A critical factor affecting the record flooding was the near continuous nature of the rainfall. Many locations in the nine-state area experienced rain on 20 days or more in July, compared to an average of 8-9 days with rain. There was measurable rain in parts of the upper Mississippi basin on every day between late June and late July. The persistent, rain-producing weather pattern in the Upper Midwest, often typical in the spring but not summer, sustained the almost daily development of rainfall during much of the summer. The Great Flood of 1993 had been set by June 1 with saturated soils and streams filled to capacity across the Upper Midwest. Runoff from the ensuing persistent heavy rains of June, July, and August had no place to go other than into the streams and river channels. Record summer rainfalls with amounts achieving 75- to 300-year frequencies thus produced record flooding on the two major rivers, equaling or exceeding flood recurrence intervals of 100 years along major portions of the upper Mississippi and lower Missouri Rivers (Fig.3) (Stallings, 1994). Significant rainfall in June and July in the Upper Midwest, combined with wet soil conditions, was the cause of severe flooding in the Upper Mississippi River basin. In mid-June, 8 inches of precipitation fell across the Upper Midwest. This resulted in flooding on rivers in Minnesota and Wisconsin and eventually pushed the Mississippi River to a crest at St. Louis on July 12th of about 43 feet, equaling the previous stage of record. In early July, Iowa was hit with numerous record rainfalls. Storm totals of up to 8 inches were again common. Record flooding occurred on the Skunk, Iowa, and Des Moines Rivers. The city of Des Moines, Iowa, was particularly hard hit by flooding on July 9th. The flow from these rivers combined with already near-record flows on the Mississippi River to push the stage at St. Louis up to a new record high stage of 47 feet on July 20th. In mid to late July, heavy rains began further west in North Dakota, Nebraska, Kansas, and Missouri. Record flooding began on rivers in Missouri, Nebraska, Kansas, North Dakota, and South Dakota. The Missouri River crested at 48.9 feet at Kansas City on July 27th breaking the previous record crest, set in 1951, by 2.7 feet. This crest pushed on down the Missouri River setting new records at Boonville, Jefferson City, Hermann, St. Charles, and other locations. This record flow joined the already full Mississippi River just north of St. Louis, and pushed the Mississippi to another record crest of 49.47 feet at St. Louis on August 1st (Parrett, 1993) (Fig. 4). In all, 92 locations set new record crests during the Great Flood of 1993. A few of those locations are shown in Table 1. The Great Flood of 1993 was unusual in other respects. It was wide spread covering nine states and 400,000 square miles. Fifty deaths occurred as a result of the flood. Over 1,000 levees were topped or failed as shown in Table 2. Also, the flood was of extremely long duration lasting at some locations for nearly 200 days as shown in Table 3. Finally, it should be recognized that this flood event was so big, it simply overwhelmed everyone and everything. As Mark Twain said a hundred years ago, the Mississippi River "cannot be tamed, curbed or confined.....you cannot bar its path with an obstruction which it will not tear down, dance over and laugh at." Braatz, D.T. (1994). 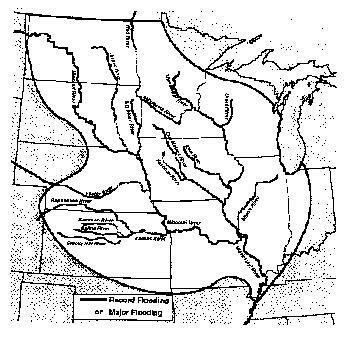 "Hydrologic Forecasting for the Great Flood of 1993," Water International, Volume 19, No.4, pp. 190-198. Josephson, D.H. (1994). "The Great Midwest Flood of 1993," Natural Disaster Survey Report, Department of Commerce, NOAA, National Weather Service, Silver Spring, Maryland. Larson, L.W. (1993). "The Great Midwest Flood of 1993," Natural Disaster Survey Report, National Weather Service, Kansas City, Missouri. Parrett, Charles, Melcher, N.B. and James, R.W. (1993). "Flood Discharges in the Upper Mississippi River Basin," in Floods in the Upper Mississippi River Basin, U.S. Geological Survey Circular 1120-A. Stallings, E.A. (1994). "Hydrometeorlogical Analysis of the Great Flood of 1993," Department of Commerce, NOAA, National Weather Service, Silver Spring, Maryland.